The Employee page displays the employees that are within your BrightPay employer file that you have linked to BrightPay Connect. Employees you add, update, or remove in BrightPay on your computer will be reflected here after your data synchronises to BrightPay Connect. 2) If data from a previous tax year has been uploaded to BrightPay Connect, simply choose whether you wish to view 'Most Recent' or a previous tax year at the top right of the screen. Please note: Some important details that must be reported to HMRC such as date of birth, National Insurance number (NINO) and tax code cannot be changed here. For security, sensitive details (e.g. payment bank account information) are not displayed here either. The payroll administrator should be contacted directly if any of these details needs to be updated. 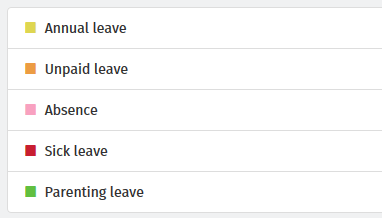 3) To add/cancel leave, select 'Add Leave', either on the employee's dashboard or when accessing the full calendar. 1) Should you wish to prevent an employee from logging into their self service portal, this can be done via their dashboard by clicking 'Manage' on the menu bar. Simply tick the box 'Prevent this employee from logging into the Employee Portal'. 2) To reset an employee's password, click 'Reset employee password' to send a password reset to the employee. This will block any login attempt using the employee's credentials until the password has been updated.